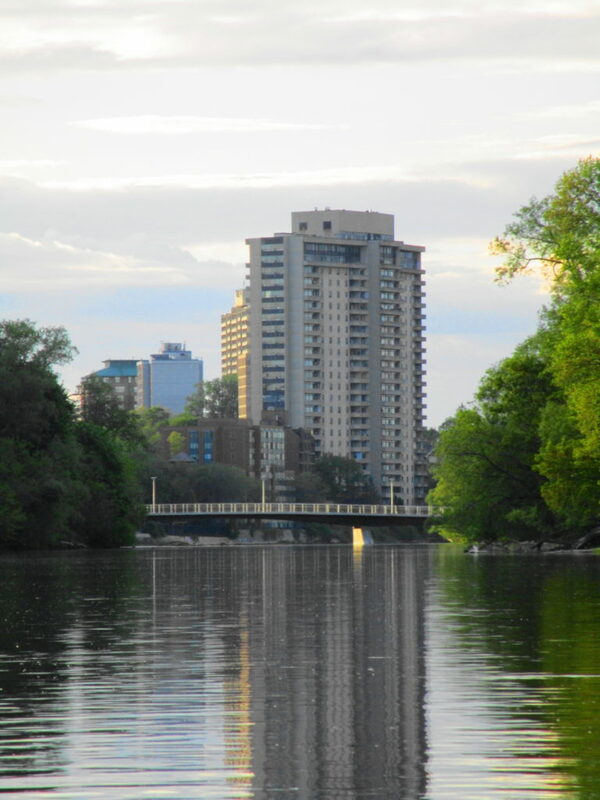 I never tire of paddling the Rideau River, especially the familiar section between Sandy Hill and Carleton University. I always find something to admire. I always reflect upon the human experience of the River, which still evolves, and which goes back at least 4000 years. On a gorgeous Saturday afternoon, while many of my friends participated in the Ottawa Race Weekend, I launched my canoe for the season’s first paddle on the Rideau. I usually make this excursion earlier in the spring, but this year’s high flows kept me off the river. 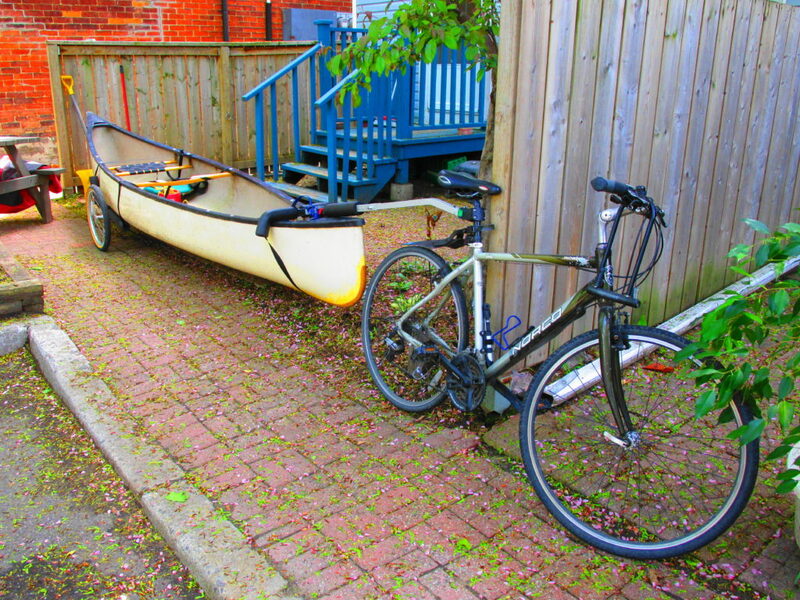 Loading my canoe on the bike trailer, I rode down to Robinson Park, launched from the beach, and turned upstream. 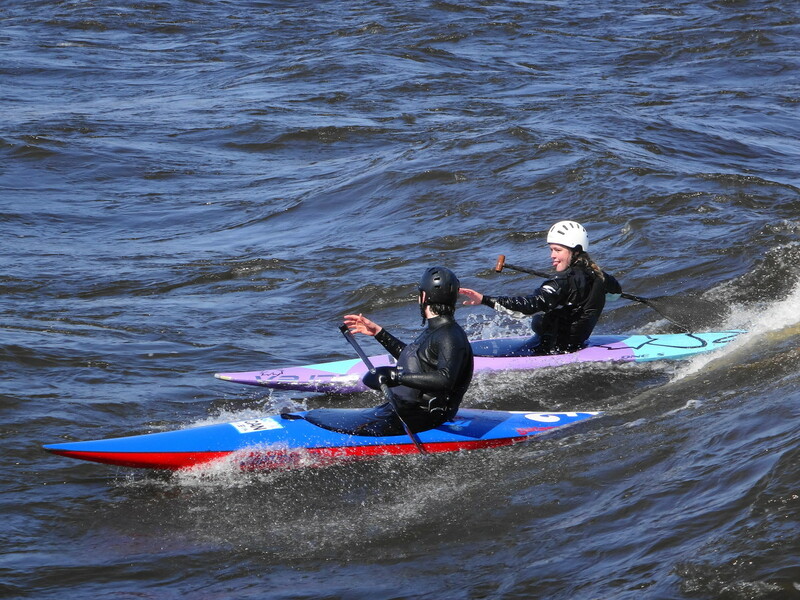 The paddling proved relatively easy, despite the strong current. I passed under the Queensway and the footbridge, skirting the shoreline and reeds in search of wildlife. My new cherrywood paddle (a birthday gift from Sue) felt good in my hands, and the tensions of the past work week eased out of my shoulders. Given the warmth of the day, I expected to see a lot of basking turtles. In the past, I’ve spotted large numbers of painted turtles, plus large snappers and even map turtles along the shore. 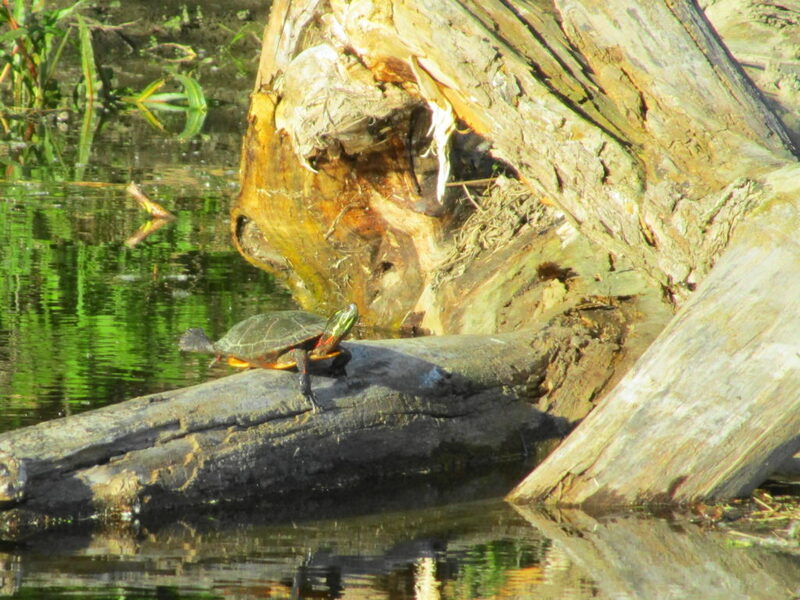 Surprisingly, in almost six hours on the river, I only found two painted turtles up on logs, along with three snappers idling in the shallows amidst the reeds. The Ministry of Natural Resources and Forestry has several old records of Blanding’s turtle along the river, and despite a decade of disappointment, I still live in hope of finding one sometime on this stretch. The hardest paddling of the day came at Billing’s Bridge, where the river flowed fast through the piers. Passing a small group of stand-up paddleboarders, I tried first for the central span, paddling hard in the eddy behind a pier and then shooting into the current. For a minute a two I held my own, but without making headway. Finally, I dropped back and moved to the next span south, where the current proved a little less challenging. One of the paddleboarders tried to follow me, but couldn’t muster enough speed. 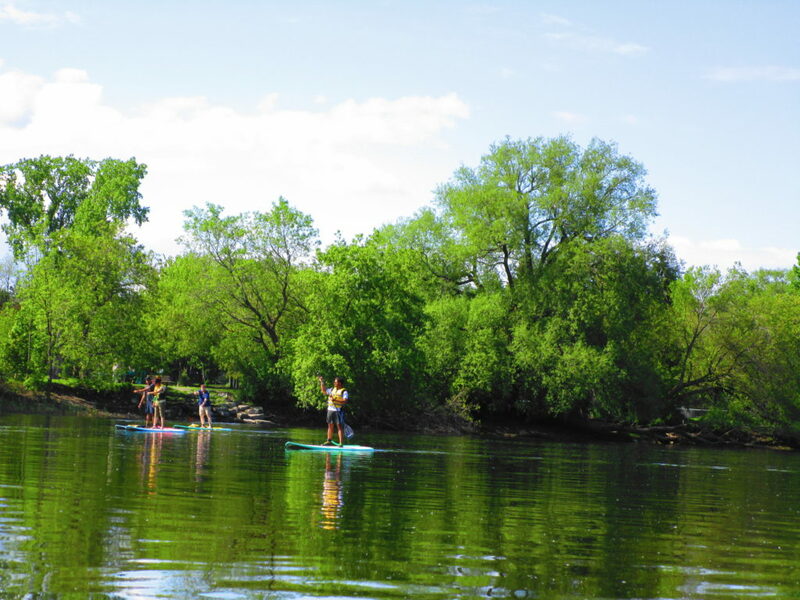 Just upstream of the bridge, several more stand-up paddleboarders practiced in the calmer pool. One of them, a very pretty young woman, struck yoga poses on her board, as her girlfriend snapped photographs. 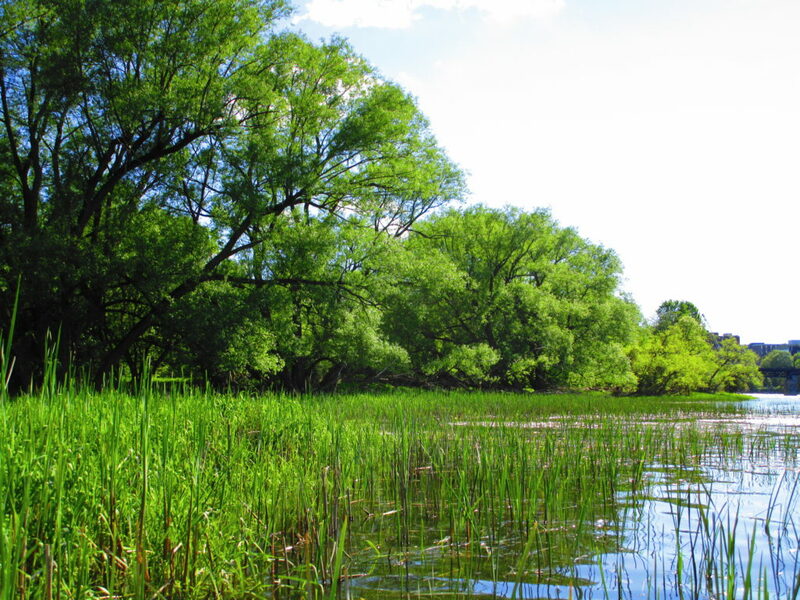 After working slowly through the riffles above Billings Bridge, I slid my canoe into the reeds at Clifford Allen Island, so that I could renew my sunscreen. 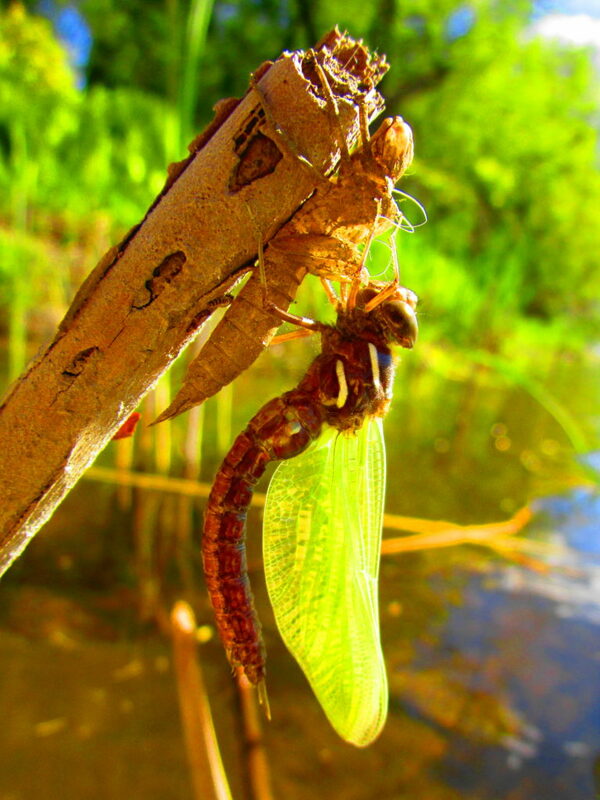 As I slathered on the cream, with a pair of geese eyeing me warily, I noticed a newly molted dragonfly drying its wings at the tip of broken, brown reed, still hanging from its discarded nymph skin. It’s colors had not yet fully developed, but the stripes on the thorax suggested some kind of darner. I had seen pretty, green darners dancing over the reeds during my paddle upstream, but they lacked the thorax stripes. Carrying on from the island, I paddled past Brewer Park to the Dunbar Bridge. 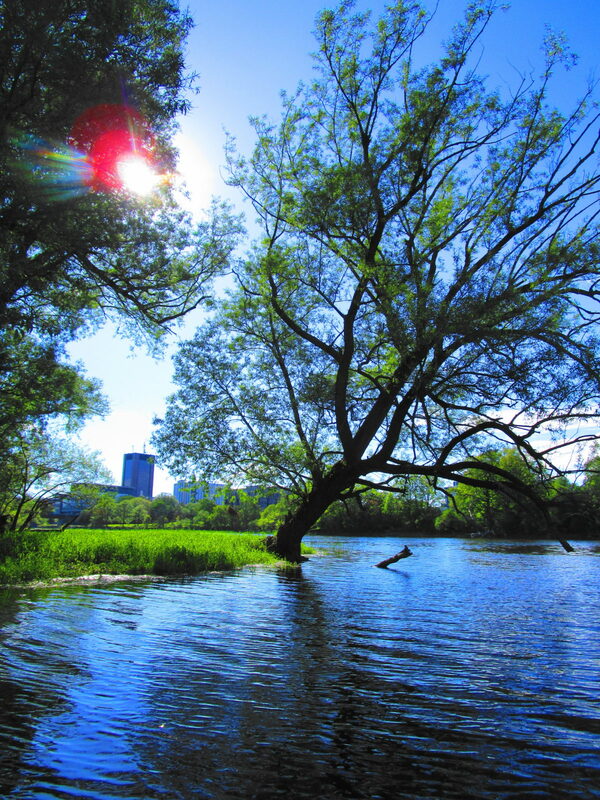 This part of the Rideau River hosts the most fascinating juxtaposition of culture in the City: literally 4000 years of history separated by barely 300 metres of river. On the north shore, nestled under the Dunbar Bridge, the House of PainT provides a venue for Ottawa’s hip-hop community, featuring its first legal graffiti wall and regular street dance festivals. 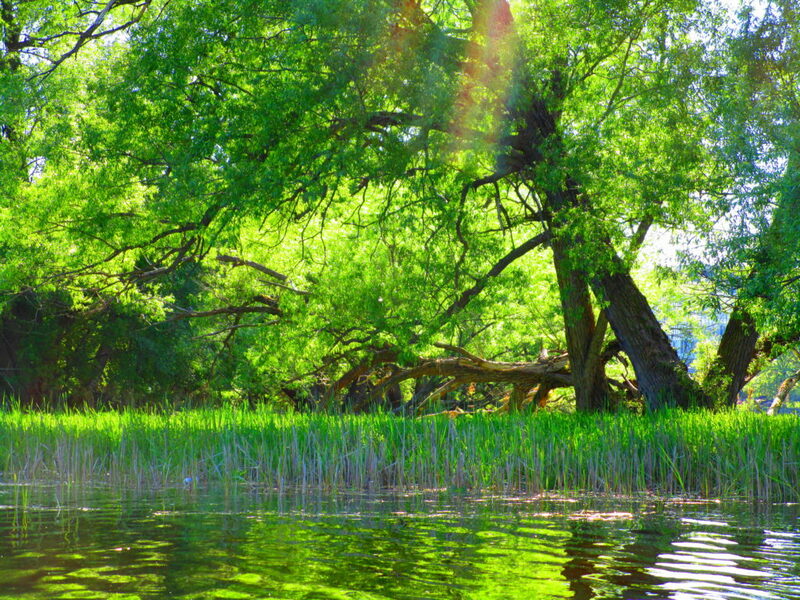 Just upstream and across the river, on the south shore at Vincent Massey Park, lies a 4000 year-old, indigenous archaeology site. Excavated by the National Capital Commission over several years, the site marks the bottom end of an old portage around the Hogsback Falls. Paddling up the south shore in late afternoon, just below the rapids under the O-Train line, one can easily imagine those Early Woodland people pulling their canoes into shore to set camp for the night, perhaps casting their nets into the river, where fishermen cast their lines today. I suspect that they chose the spot as much for its beauty as for its convenience. I turned back downstream in late afternoon, alternating drifting and paddling gently. 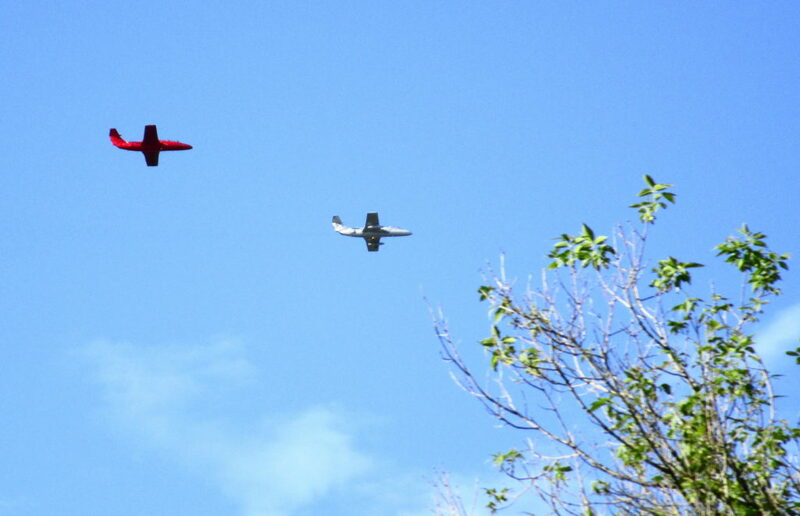 For awhile, I watched two jets circling over the City in formation as part of the race weekend celebrations. Gradually, as the light mellowed, the wildlife became a bit more active. 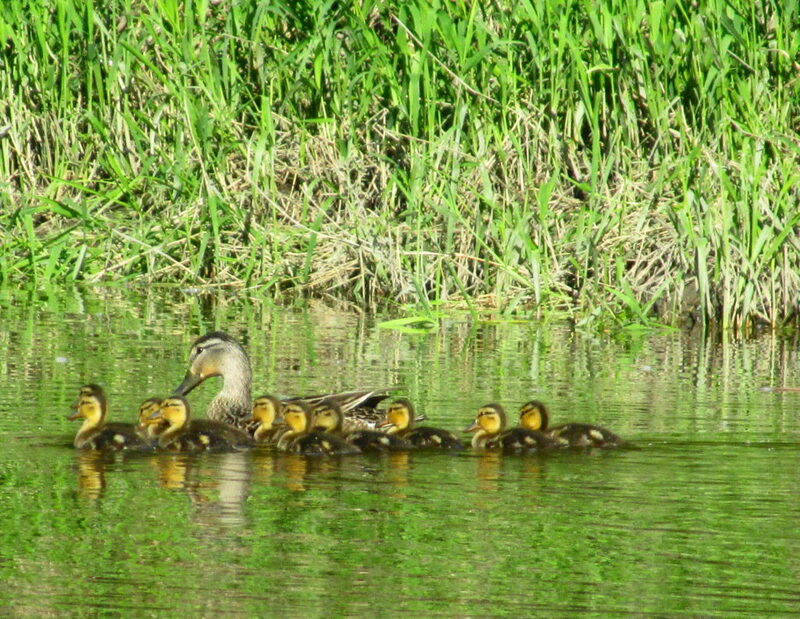 Just above Billings Bridge, a female mallard shepherded her large brood of ducklings. I could not help but think of the large muskellunge known from the area, and wonder how many ducklings would survive the summer. 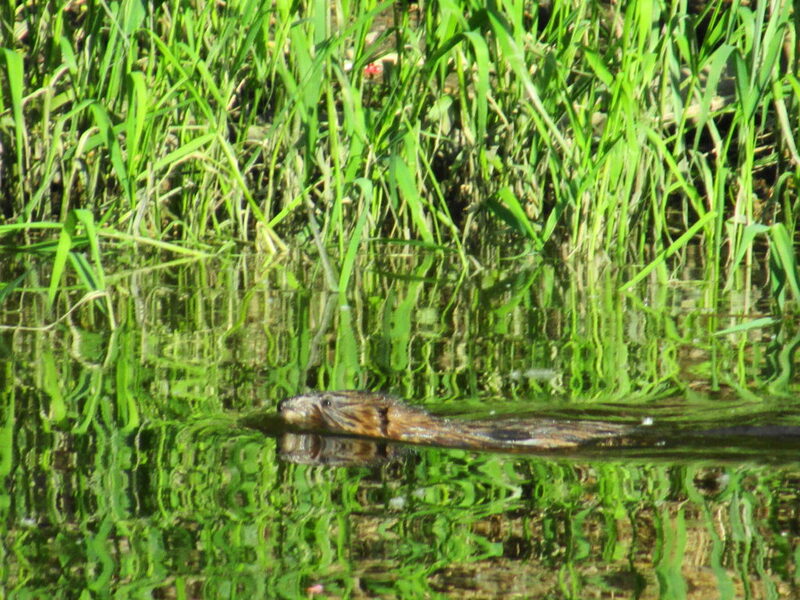 Further downstream, a muskrat plied the shoreline in the shadows of the trees. 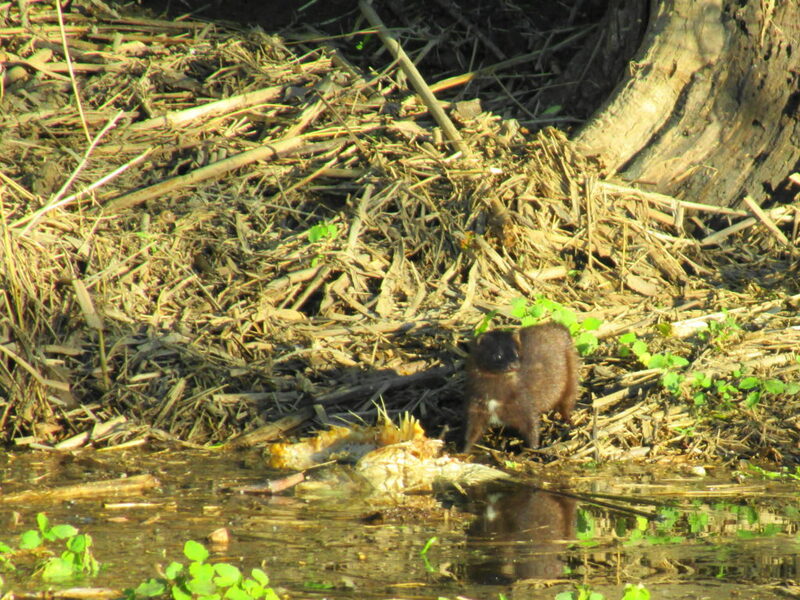 Finally, near the end of the paddle, I came upon a mink feeding on the carcass of a carp at the edge of the shore. I shot a few, quick photographs, then circled back to take a few more, only to see the mink slip back into the shadow of the trees. I pulled back into Robinson Park, just as the evening sun was dropping behind the City. I looked down the peaceful waterway to the Adawe Crossing at Strathcona Park. 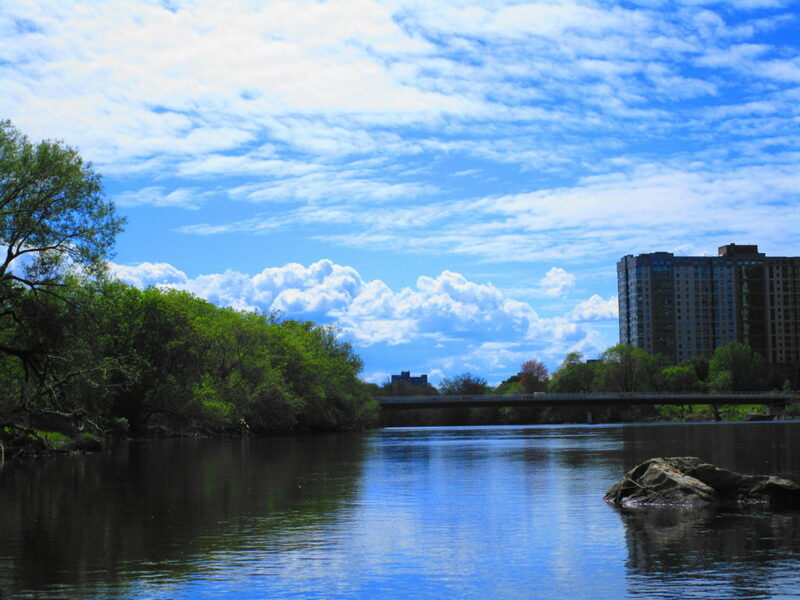 The serenity of the scene encapsulated the beautiful dichotomy of this wonderful urban river. I sometimes wonder if I could still learn to paddle whitewater. Then I remember how much my knees complain simply climbing into my open canoe. 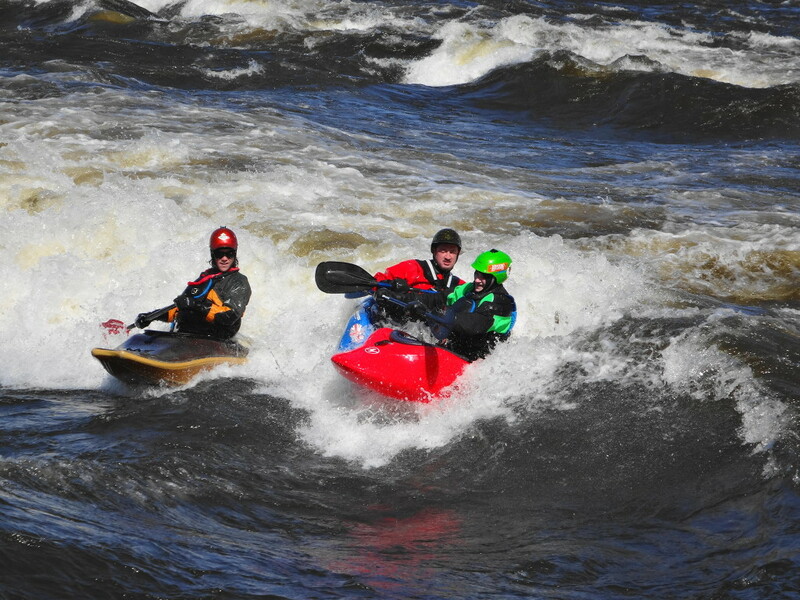 Could I really fit myself into a whitewater canoe or kayak? Could I get out? Nonetheless, whenever I watch the paddlers on the waves at Bate Island, the hankering strikes again. With temperatures climbing into the low teens, I’d set out to cycle along the Ottawa River, up Pinecrest Creek, back to the Experimental Farm and Arboretum, and then home along the Rideau Canal. I didn’t make it. Enough snow lingered along the pathway beside the river to convince me that Pinecrest Creek would be impassable except on a fat bike. Instead, seeing the cars parked at Bate Island, I decided to detour for a look at “The Wave”. 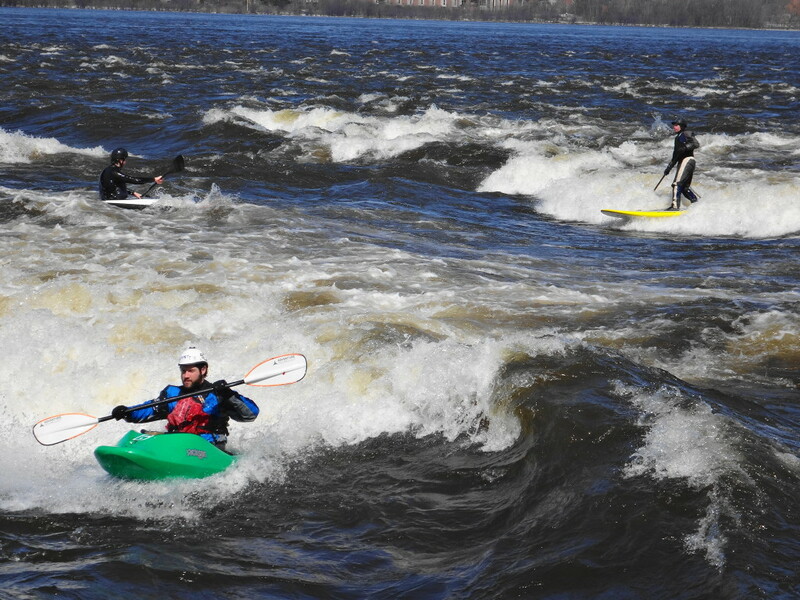 It lies just below the Champlain Bridge, on the west side of Bate Island: a standing wave, only a few metres offshore, curling perpetually in the swift current. Actually, in Spring conditions, several waves stand out from the shore. However, “The Wave”, as it is known, has just the right curl to cradle a paddler, while the adjacent boil provides the perfect conditions for tricks. Canoeists, kayakers, stand-up paddlers and surfers line up along the retaining wall to take turns lancing into the current. More experienced paddlers advise the novices on which line to take and how hard to paddle. Each paddler takes a couple of minutes carving the water, and then bails out for the next person to slide into place. 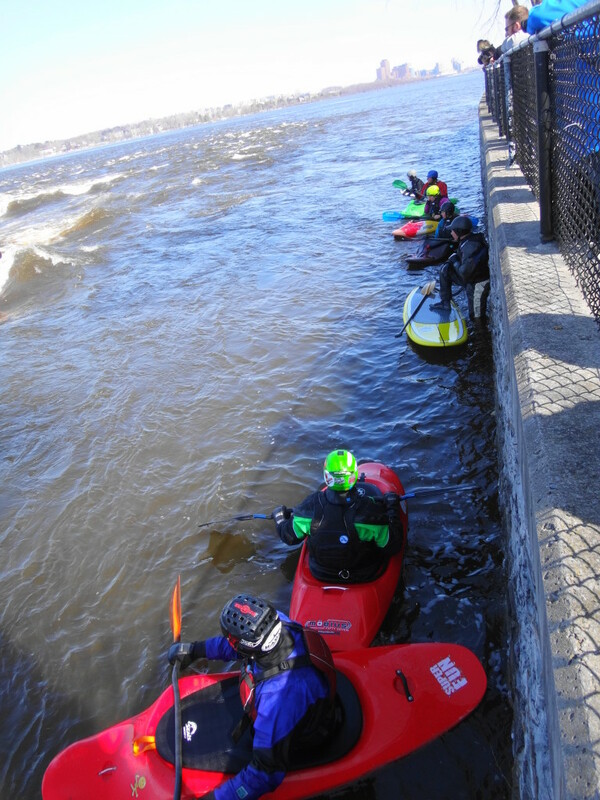 Sometimes several paddlers will launch together in a competition to see who can hold their place amid the bumping of the kayaks. The losers roll over the wave and bob away down the short chain of rapids into the lee of the island, while the winner celebrates with a few spins. The stand-up paddleboarders impress me the most. 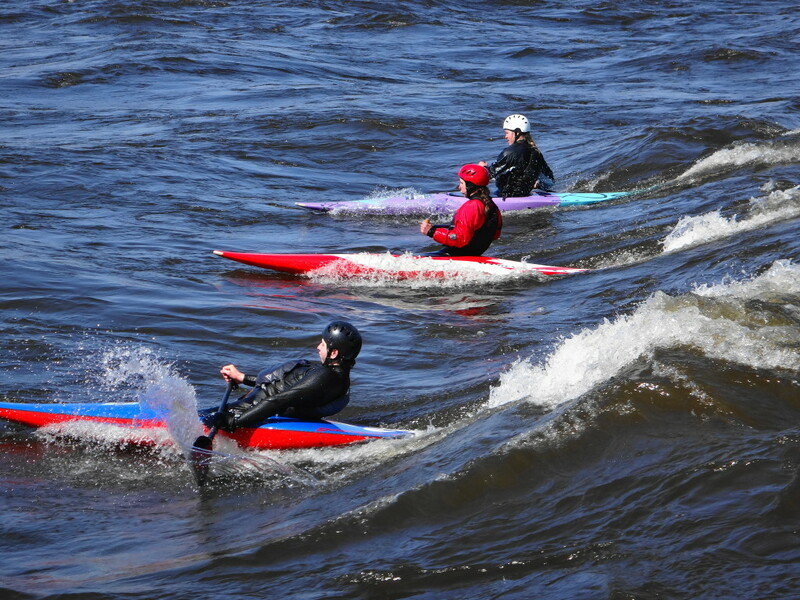 Although they seem relatively tame in comparison to the kayakers, I admire their skill in manoeuvring their long boards through the whitewater, with only a paddle and the feel of the river through their feet to guide them. My heart, though, lies with the canoeists. Leaning into their single-bladed paddles, and rocketing their streamlined craft into the surf, they seem like the greyhounds of the waves. I love to watch the spray knifing from their hulls and blades as they hiss across the face of the wave. Perhaps one of these days, I’ll join them. Bate Island can be accessed from the Champlain Bridge, heading west toward Quebec. Parking is abundant. 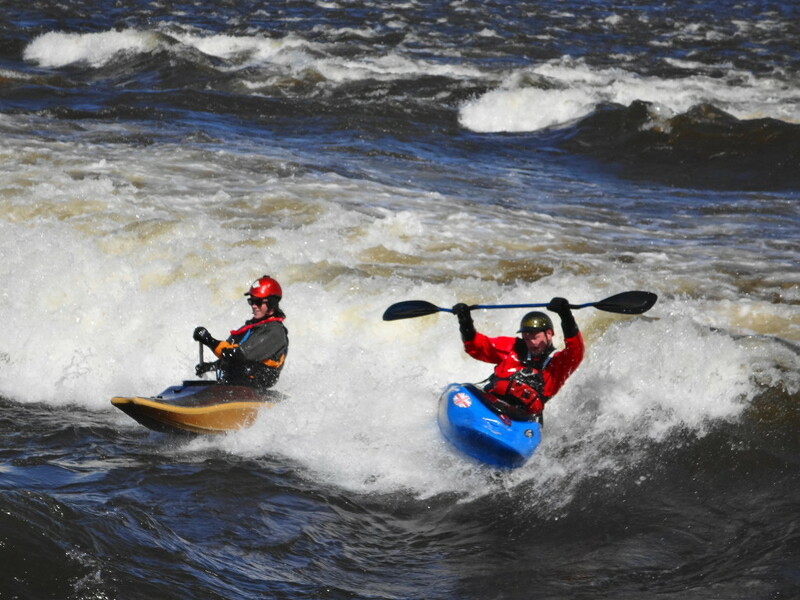 Whitewater paddling is inherently risky, and the Ottawa River is cold, even in Summer. 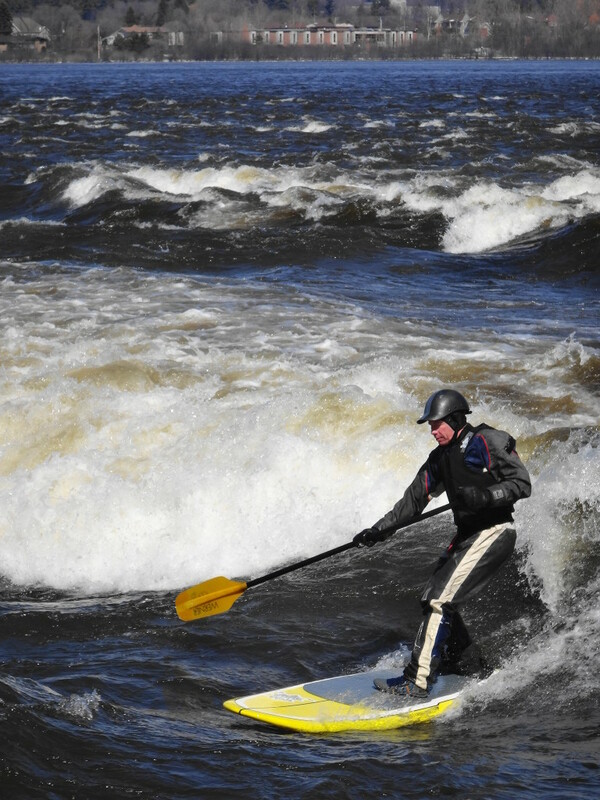 Never paddle alone, and always wear a wetsuit, flotation device and helmet.